Protect your eyes when using a Smart Phone. - Solutions Northwest, Inc. Protect your eyes when using a Smart Phone. Whether it is the smart phone’s tiny screen, the tiny images and text, or the screen’s light, it is important to be cautious and aware of the risks of digital eyestrain. Too much screen time can cause many eye-related symptoms such as discomfort, eyestrain, blurred vision, dry eyes, headache, fatigue, difficulty focusing, and shoulder and neck pain. Most smartphones have a feature to make letters on the screen bigger. The most common way to do this is starting with your fingers in a pinched position touching the screen and pulling your fingers apart until the letters are big enough. The letters should be at least as large as the green serial numbers on the front of a dollar bill. Go into the phone settings menu and adjust the screen brightness level to about half. Most phones come with a factory brightness setting which is equivalent to looking at a light bulb. When choosing a color scheme, the ones which are easiest on the eyes are a white background with black text or a black background with green text. Use the phone in a position where there is not glare on the screen, reduce the screen glare to reduce eye strain. 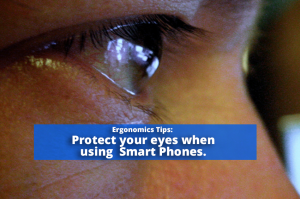 Try some Eye Exercises that we have featured in a previous Ergonomics Blog. For more guidance on all things Ergonomics, visit SolutionsNW.com or Contact Us for more information.